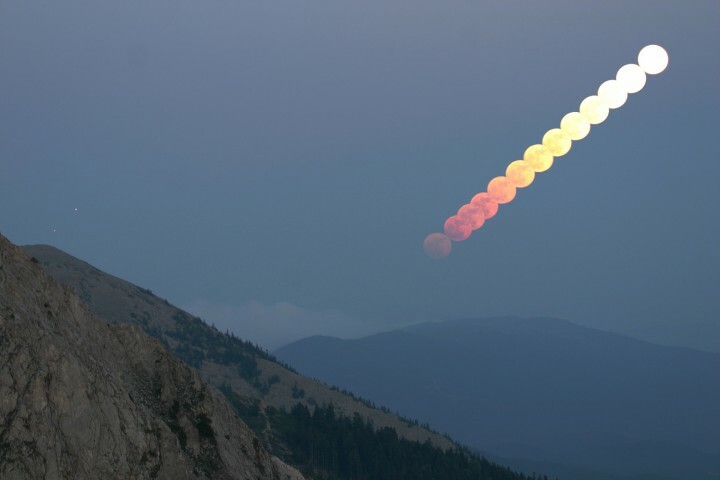 Explanation: On May 31st, a gorgeous Full Moon rose over Uludag Mountain in Bursa Province, Turkey. This alluring telephoto view of the twilight scene is a composite of images taken roughly every two minutes beginning shortly after Sunset, following the rising Moon as it moves up and to the right. Of course, as the Moon rises it gets brighter and changes color, becoming less reddened as the sight-line through the dense atmosphere is steadily reduced. Each of the final two exposures also captured a rising planet Jupiter. Like the Full Moon, the bright, wandering planet is nearly opposite the Sun in Earth's sky and was caught on the lefthand side of the picture in two places, just above a small peak in the mountain side. Intriguingly, some considered this Full Moon a Blue Moon.